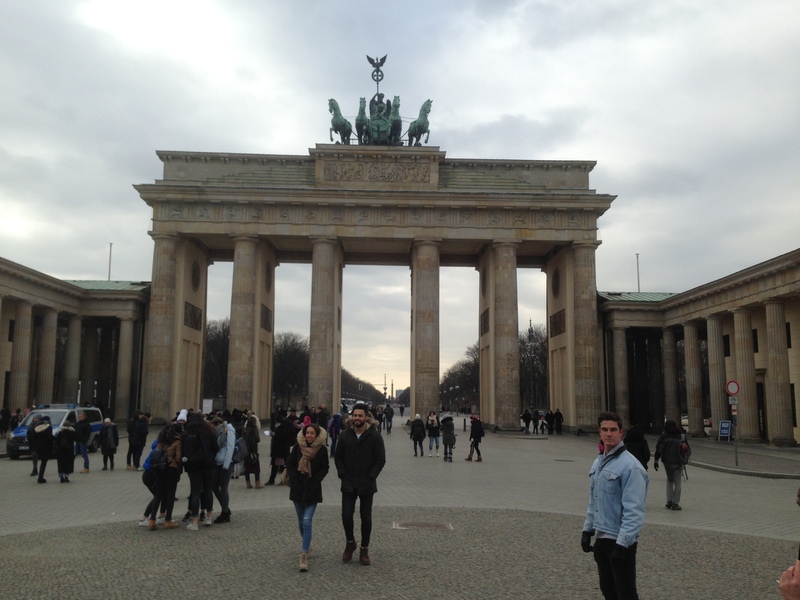 A Wee Trip to Berlin! As you’ll know, the Best from the East didn’t just hit Great Britain. It did a wee European tour too, stopping to blow icy kisses wherever it went. Snow in Barcelona—I ask you! We travelled to Berlin last Sunday (the 25th). #StormEmma* didn’t make an appearance, but the temperature barely rose above minus two. The storm kept away, but it meant our four-night break turned into six. Aside from industrial quantities of snow, nothing was getting into the UK’s air space. The Spy Museum. Berlin’s an obvious place to plant a spy museum, and this place details the history of spying. James Bond bears as much resemblance to a real spy as… well, me. But he’s maybe the best-known fictional one, so the museum pays him homage too. The Topography of Terror, which is sited on the grounds of the building that housed the Secret State Police Office, the leadership of the SS and the Reich Security Main Office. Chilling. The German History Museum. I tried and failed to imagine the collective worth of the artefacts in this museum which documents some 2,000 years of German history. If you go to this one, allow more time than we did… (two hours). Bunker toured. The Underworlds Association runs underground tours, and this one explores an old bunker used by the population as an air raid shelter during the Second World War. Found out about the Stolpersteine. Outside our hotel, we spotted these. 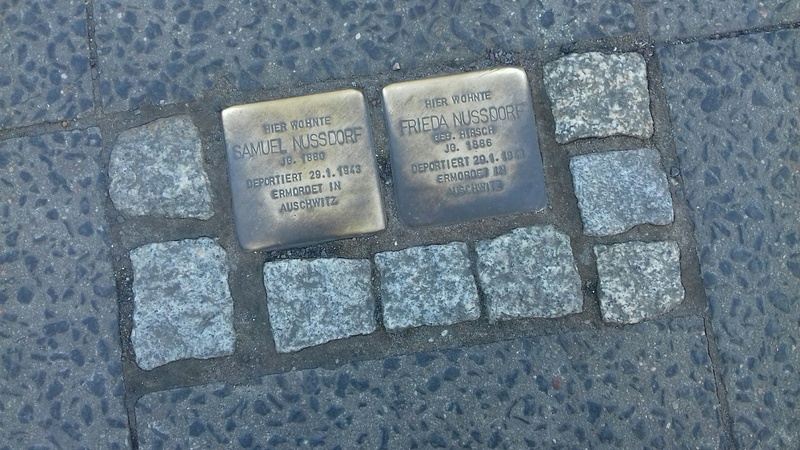 Stolpersteine are part of a project that has been ongoing since 1992. The German artist Gunter Demnig designed it as a tribute to Europe’s holocaust victims. They mark the last known sight where a Jewish person lived or worked voluntarily, and they are in 22 countries in Europe including Germany. They also include tributes to others murdered by the Nazis, such as Roma and Sinti people, gays and people with mental or physical disabilities, and political opponents. Look them up on Wikipedia as they are fascinating. And controversial. Some cities have refused them. They see stones on the ground that people could walk over oblivious as disrespectful. Took ourselves off to the Harrods of the East—KaDaWe, Berlin’s biggest department store and the second largest in Europe. My wee stock of euros would be viewed disdainfully in there, but the food department is lust-worthy. Wander those stalls with your tongue hanging out. There’s a champagne bar, an oyster bar, seafood, currywurst and Vietnamese cooking stalls and more chocolate than I’ve seen in one place for a while. German food is well suited to the cold. If you’re not a fan of pork and potatoes, the native cuisine’s not for you. My husband adores it. 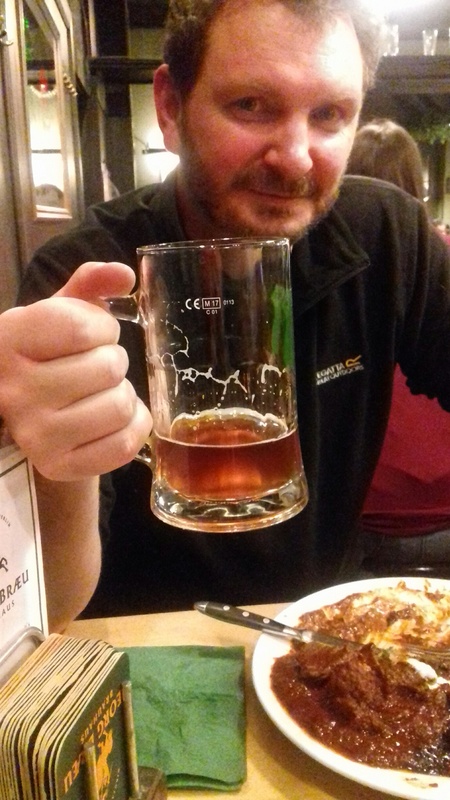 Sausages, pork knuckle and a lot of great beer. You could say he’s a male cliché when it comes to eating. He wouldn’t argue. For those not so keen on the Pig and its multiple products, Vietnamese restaurants are everywhere. You don’t have to wander far for a kebab in Berlin either. The Turks flooded into Germany post World War Two and the Germanised version of the kebab is a thing quite different from what you might have eaten in the UK. Lighter and fresher I reckon. Berlin’s also jumped onto the vegan bandwagon. (I imagine its founding fathers spin in their graves at that.) If you’re looking for veggie and vegan options, you need not go far. 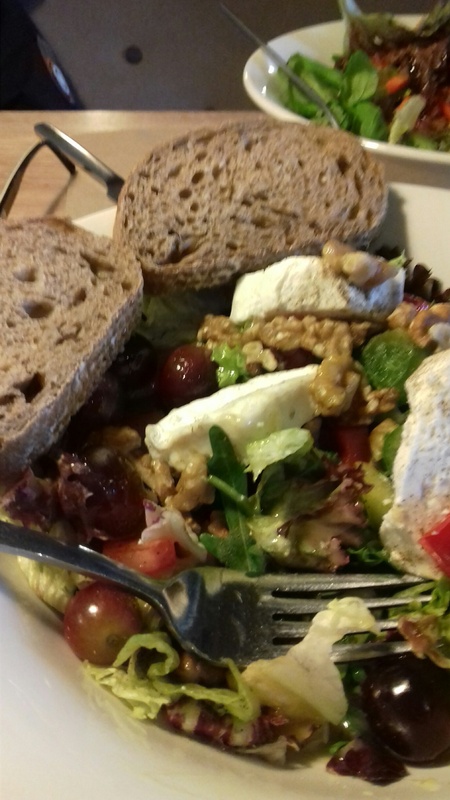 This isn’t a vegan dish (spot the goat’s cheese) but I found it in a restaurant serving up an equal number of meat, vegetarian and vegan choices. I wish Mama Nature had made me like beer. Had she tapped me with the hops-lovin’ wand, I’d have been happy as a pig in the proverbial. 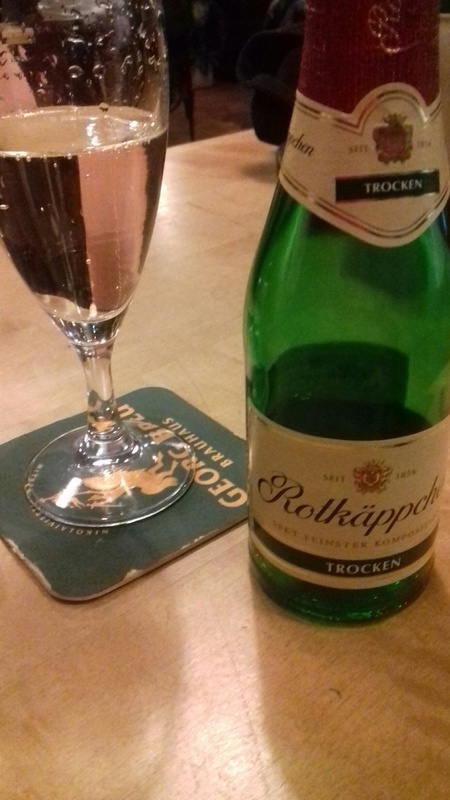 But I discovered a German sparkling wine I loved. You could even buy this stuff from vending machines in hotels. On day four, we decamped from our hotel. The Thursday flight back to the UK was cancelled, and we needed somewhere cheap to stay. We went deep east, an area surrounded by huge tower blocks and little in the way of amenities even now. On the theme of making your euros go as far as possible, we walked everywhere, skipped one meal a day and ate out in kebab shops. Proof that a lot of walking was done (left). I had to take the picture to share with my family WhatsApp group. What are WhatsApp groups for, after all, but petty point-scoring?! We also ventured into an old-school pub that’s easy to imagine being there when the divide existed. I don’t think it has changed since then. You could even smoke there if you wanted. It’s a long time since I’ve been in a public space where folks puff away. But a pint and a wee bottle of afore-mentioned German fizz cost five euros. We choked and bore it. There are plenty of free things to do in Berlin. For a start, signs posts are dotted everywhere telling the history of a place. Berlin’s Holocaust Memorial is free too. I’d been before, but we visited again to pay our respects. Particularly moving are the displays that feature individual families from different countries. You learn the before stories, how they lived and who they were. This isn’t an extensive exhibit which perhaps is controversial. The installation outside is obscure, but then surely art’s point is to make you think? 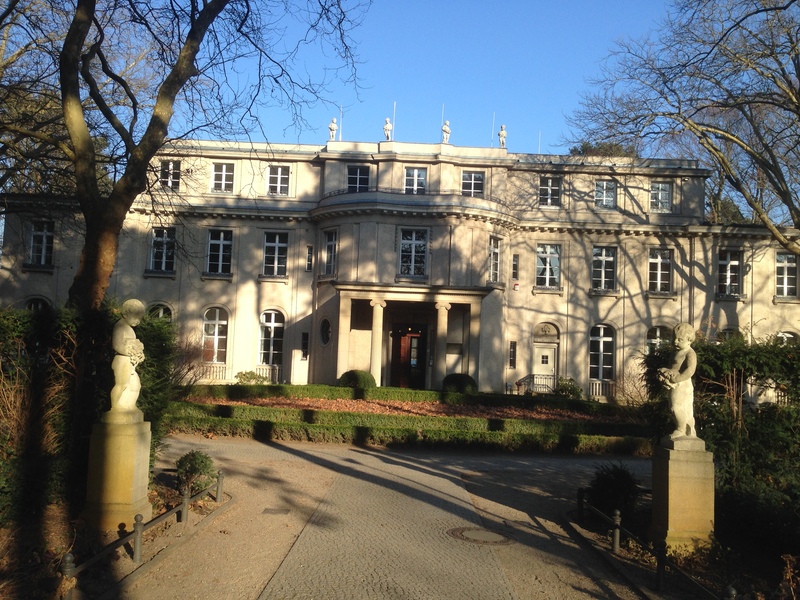 The House of the Wannsee Conference is free too. It’s a trek, as you need to get a train out to Wannsee and then it’s a two-and-half kilometre walk from the station. It’s worth it, though. Transpose the beauty and tranquillity of the place with the evil of what was planned there. Another freebie is the Willi Brandt museum, which offers a fascinating insight into arguably German’s most famous post-war politician. *Kind of weirdly flattered such a huge weather event was in my name. Wrong, I know. **It does NOT. The pound-euro exchange rate is terrible. 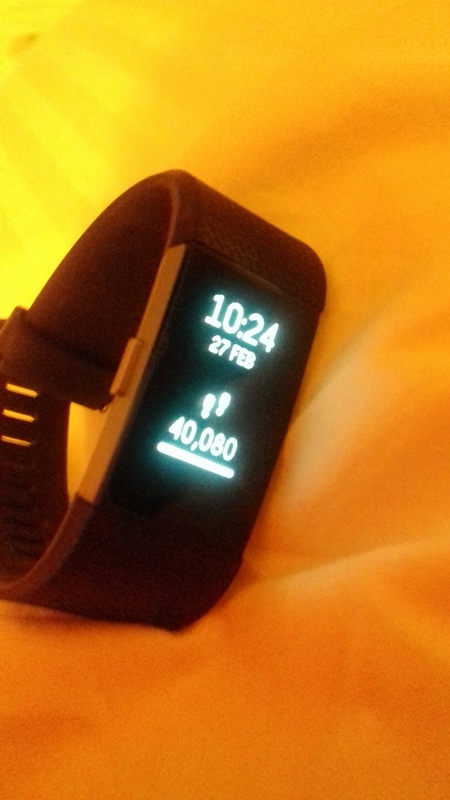 Is that 40,000 steps in one day??? Yes – it’s about 18 miles. We saw lots of hardy folks cycling, as that seems to be a main form of transport in the city. It looked safer than it does in UK cities as there’s a well-established network of cycling routes. But you need to be tough to bike anywhere in minus five! We used the U-Bahn/S-Bahn network to get from the airport to our hotel and back, and bought a 5-day ticket for not very much at all. Cut down on the walking a bit! I quite like using public transport in strange cities, actually, you see all sorts of different bits. Good job, Gary! Bacon for breakfast, currywurst for lunch and pork knuckle with sauerkraut for dinner! I could do that. Sounds like Berlin is a place where I’d have a good time.